Hand-made aromatherapy soaps are filled with natural organic oils and pure herbal ingredients to clean, moisturize and nourish skin. Key Ingredients: Essential Oils, Herbal Ingredients and Organic Shea Butter. Our reputed entity is engaged in supplying Aroma Soap. We are indulged in offering the finest quality Aroma Soap. With our in-depth knowledge in this domain, we are actively engaged in manufacturing an excellent quality range of Aroma Soap. It contains natural aromatic therapy and made up of Lavender oil . It minimizes pimples, acne after use of Aroma soap. It reduces the side effects of other daily used cosmetics and creams and keep face glowing and improves your beauty. Shea n cocoa butter with other natural oils..
Act as natural moisturizer n prevents skin from drying..
Banking on our enriched industry experience, we are able to supply Aroma Soap. 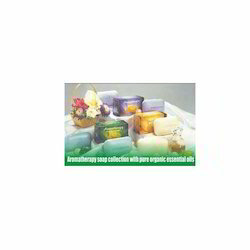 From our wide consignment, we are engaged in supplying Aroma Soap. We are a top notch supplier of Aroma Soap. We are a top-notch organization, engaged in providing Aroma Soap. 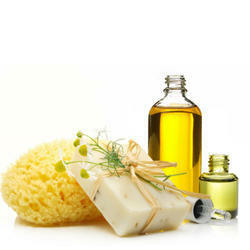 In order to meet excellent quality standards, we are supplying Aroma Soap. Experience spa-luxury at home when you shower with Atulya, our Lemongrass Clary Sage Soap - the 100% natural aromatherapy bathbar. It's uniquely fresh, spicy almost citrusy aroma will help wake up dull, lifeless skin and restore a healthy tone and luster for all skin types.